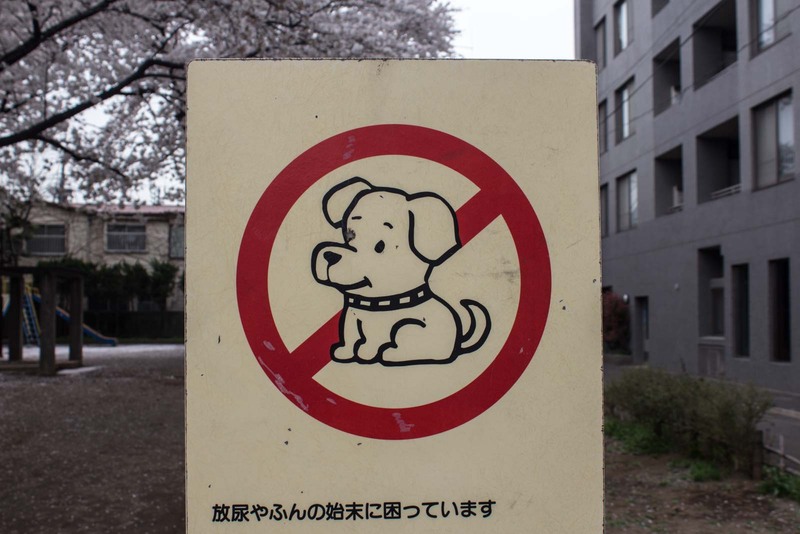 In Japan, rules aren’t mere suggestions. They’re not to be bent, ignored, mocked or challenged. They are the rules and all obey. Which makes things very orderly – because there are a lot rules! The red circle with the line through it is as ubiquitous as, say, sushi. Every few metres a sign instructs you that you can’t do something. Well before you’ve even considered an action, you’ve been told it’s forbidden. Thinking of leaning your bike there? You can’t! Thinking of walking your dog there? You can’t! Thinking of thinking? You can’t! If it’s thinking of breaking one of the rules, we’re talking about. And the people of Japan just accept it. That’s the way things are. It’s interesting to note that not a single sign includes the threat of a fine or other punishment. There’s an assumption that if the people are told something is not allowed, they won’t do it… so why bother with a warning? Take Tokyo as an example. 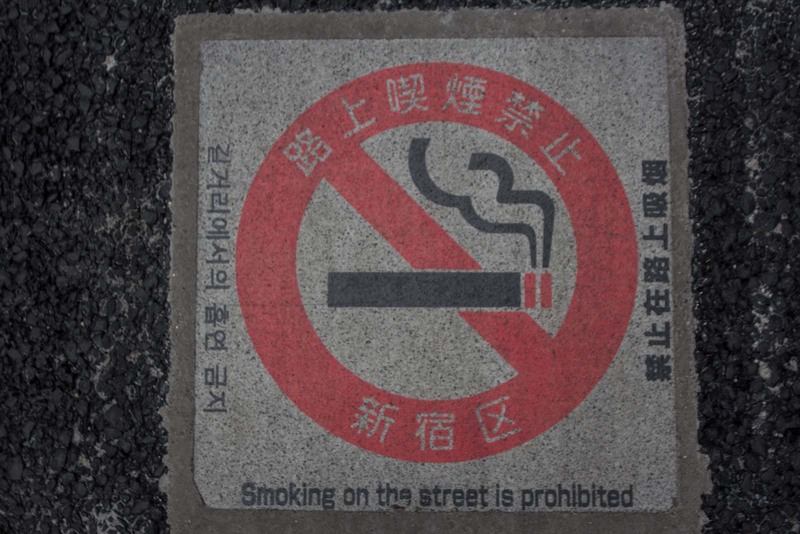 In almost every public street it is forbidden to smoke. Signs on the footpath tell you so and, in case you didn’t get the message the first time, more signs on railings and power poles remind you. 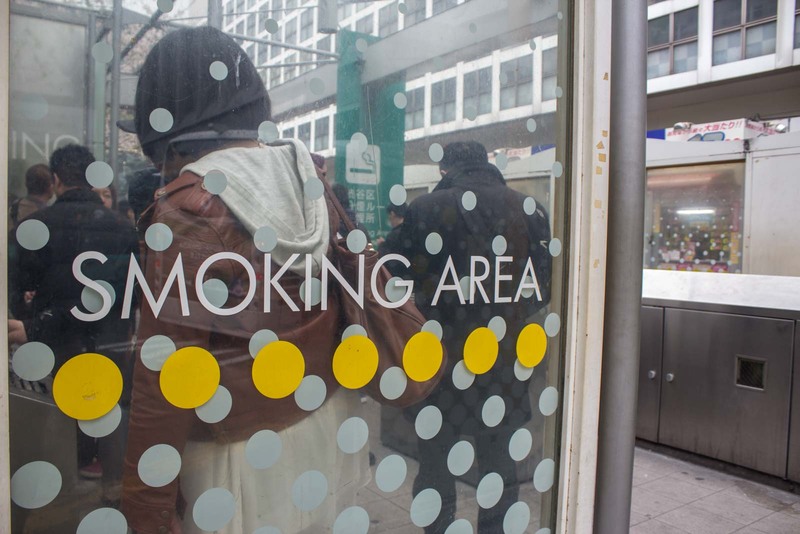 The smokers are banished to small little spaces to light up – a designated area at the entrance to a train station, for example, or in front of a convenience store. The areas are well marked and ashtrays are provided. Because this is as much about controlling the litter as it is keeping the smoke away from other pedestrians. Even going to a park seems to be an experience less about having fun and more about following the regulations in an orderly fashion. No Frisbee, no drums, no crying, no pets, no skating, no balls, and on and on. I know a lot of countries and cities have signs like this in their parks but this seems to be taking things to the extreme. Perhaps parks in Tokyo are just for admiring cherry blossoms and then moving on. The trains are certainly not immune from rules either – and the most unusual one you come across is to do with phones. It’s basically forbidden to talk on our mobile in any carriages. 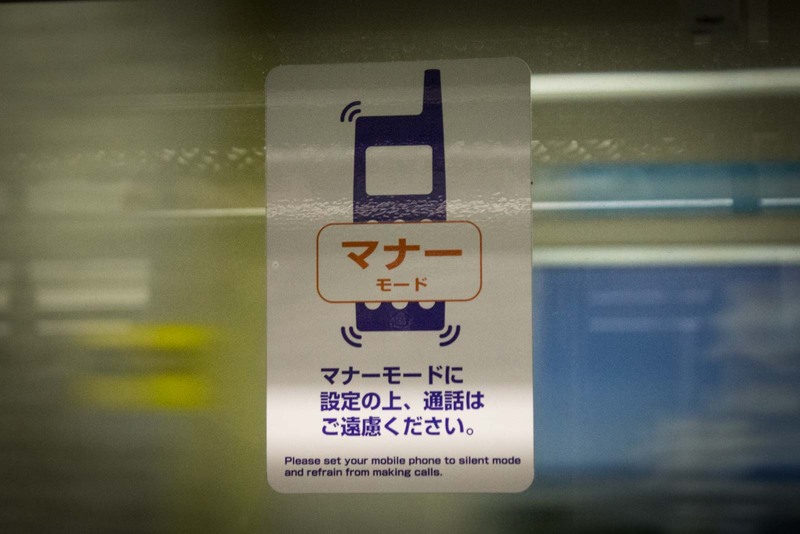 Signs instruct you to turn your phone to silent – or, as they call it in Japan, ‘manner mode’. The name itself tells you everything you need to know about what the people think of the sound of a phone ringing. I’ve never really understood this myself because surely two people sitting next to you and chatting to each other I just as annoying as someone on their mobile, but that’s not banned (yet!). 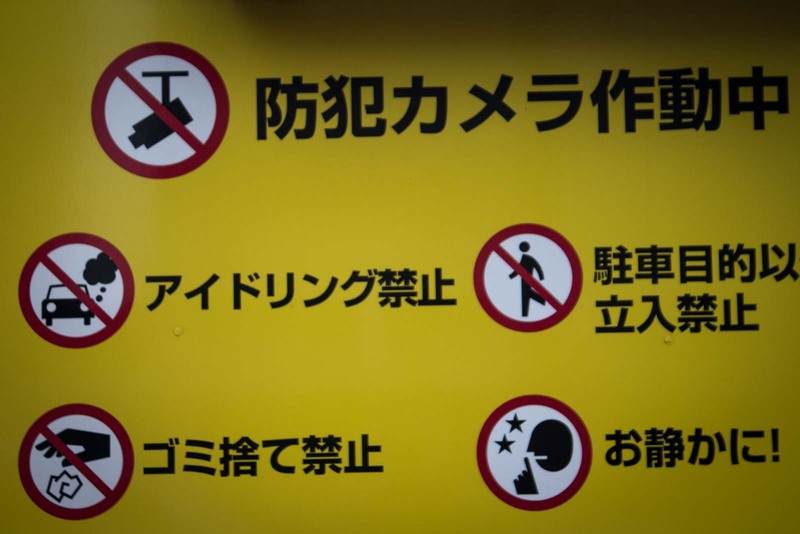 The Japanese love their rules. They obey the lights at pedestrian crossings like it would be a cardinal sin to walk across the road when the little red man was staring them down. In the middle of the night, when not a single car is around, and the road is only a few metres wide, they will still stand there patiently until the light turns green. There’s no sense of frustration or impatience – just an obliging manner. It’s hard for me to stand there and wait with them when I’m so used to crossing if there’s no obvious danger. One time I tried and I got a very polite death stare. Overall, the rules and the unqualified acceptance of them is all about putting the comfort of others above your own desires. It’s about a society where the greater good is more important and where structure is needed to keep such small populated places workable and orderly. Can you imagine what it would be like if there was smoke everywhere in the streets, phones ringing all the time on trains, bikes leaning on fences everywhere and people rushing about all over the place? Rules might seem strict, but most people don’t stick to them. For example, you’re not supposed to ride your bicycle holding your umbrella, yet almost everybody does it (including me). You’re not allowed to speak on the phone in the train, but many people do it. I don’t know… I don’t want to question someone who lives here but I’ve hardly seen ANYONE break the rules. Especially the waiting at traffic lights one. I can’t tell you how annoyed I get when there are absolutely no cars around and nobody walks across. When I was just a tourist in Japan I didn’t notice a lot of things. Also, I crossed the road in Germany on a red light once, where there was no evidence of any traffic coming from anywhere. Sadly I did this next to a parked up police car, who spent a great deal of time explaining to me the illegality of my action. Turns out you can only cross on a green light in Germany. I was lucky to get away with just a verbal dressing down, after pleading the “I’m a poor Brit who doesn’t speak German” defence.. I kind of like the one-sided conversations. When I’m bored on the bus or the train I like to imagine I’m the person at the other end and play out the conversation in my head as we go along. Sometimes I seem to get it right, sometimes I get it wrong… with hilarious consequences! Do you think we could make a TV show out of this? I absolutely love the rule forbidding phone conversations on the train (long-distance trains do have a designated “phone area”, just like they have a “smoking area”). It seems like a regular conversation would be just as bad as a phone conversation, but it’s not. Phone conversations are so much more annoying somehow and I loved not having to listen to them. 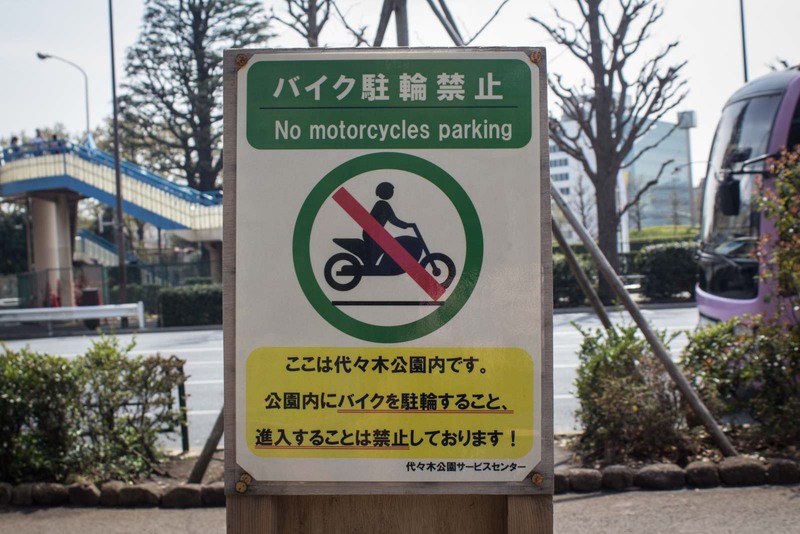 As for the abundance of rules in general–they definitely go overboard in Japan and it is probably the thing that annoyed me the most when living there. And I say that having grown up in Germany (although I always disliked that aspect of German life too). People seem to get used to the rules pretty quickly. I mean, they’re only there to make life more comfortable for everyone – and when you’ve got that many people in such a small area, that’s kind of important. It’s like the markers telling you where to wait for the doors of the train. 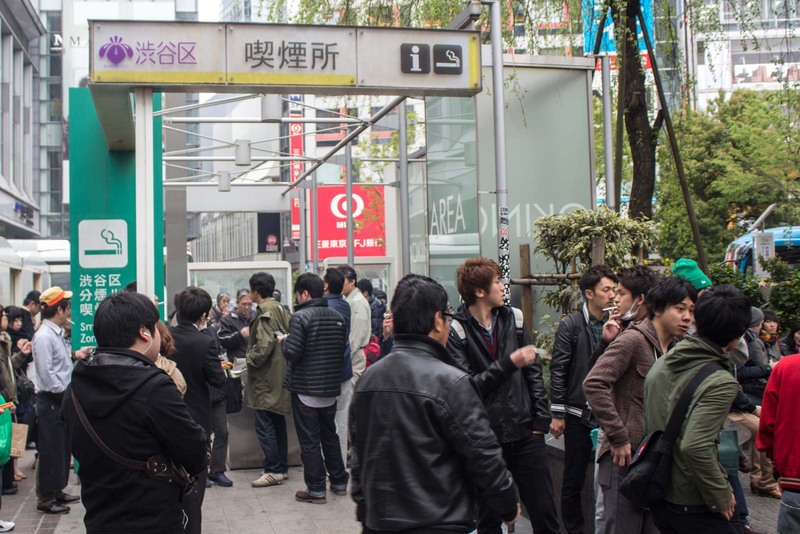 You don’t need them in many cities because it’s just not that busy but it would be mayhem in Tokyo without them! Hahaha–“That’s what China is for!” Spot on! News to me about no smoking in the streets. Must be pretty awful in those little smoking areas. The park signs are pretty funny. I agree — there should be no crying in parks. The smoking areas aren’t too bad because they’re open air. It’s probably a lot better than constant passive smoke from people on the footpaths. Manner mode sounds good to me. Another thing I remember from the Tokyo metro is the fare adjustment machines. If you paid for a shorter ride than the one you actually took, you couldn’t get out without paying the difference. Whether you paid too little with good intentions or tried to sneak, there were no fines or public humiliation or anything, just pay the difference. The fare adjustment machines are great! Really handy. I’ve seen quite a few people just buy the cheapest ticket and then work out exactly where they want to get off once they’re on the train – then they just pay the extra when they get there. Wow, that seems like an awful lot of rules! And here we had been considering living in Japan for a few years. I’m not sure I could abide by all those rules. You get used to them and they’re not overly intrusive if you’re the kind of person who doesn’t drop rubbish, smoke in public or leave your bike lying around. It’s just odd that they’re so overt about so many things being forbidden and there are signs everywhere!! 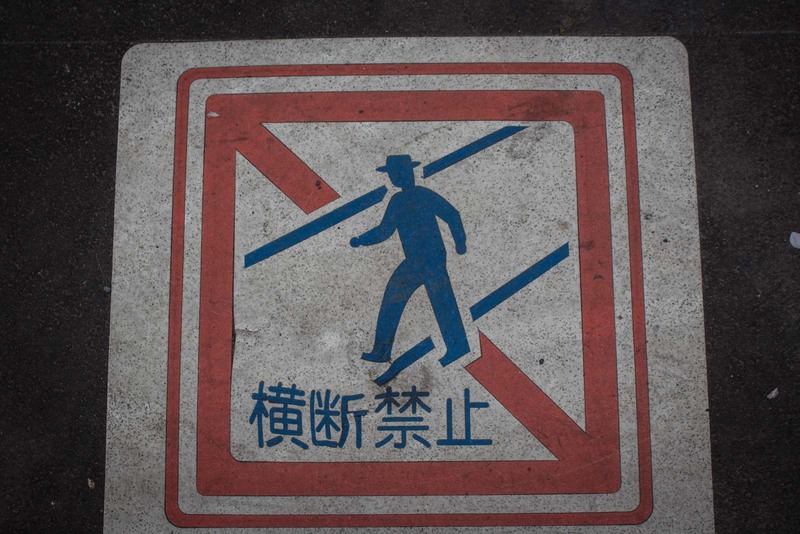 This is SO much like Germany, including the ban on walking when the red man is there. And yet we do it and just ignore the children that point and cry. I think a lot of it comes from having a society that is so densely populated. There has to be some set of strict control to keep people civil enough to live in that proximity. I’ve thought about the cellphone thing on the trams too. It IS somehow more annoying to have someone talking on a phone than to a neighbour. For one there is an odd feeling to get over that they are not just talking to the air (or themselves), but into a little machine. Secondly, phones seem to make people talk louder into them to be heard over the connection and commotion, so they are just louder. OK, I will give up the point about mobile phones. It’s true that people seem to speak louder into them and it’s quite annoying when you’ve got someone at the back of the bus shouting half a conversation that you can hear at the front. But I still think they should ban any conversation at all if they really want to make people’s lives more pleasant. Yeah, the toilets are insane! But what I love so much about Japan is just how different the cultural things are. There are so many similarities in countries around the world but Japan is so unique! 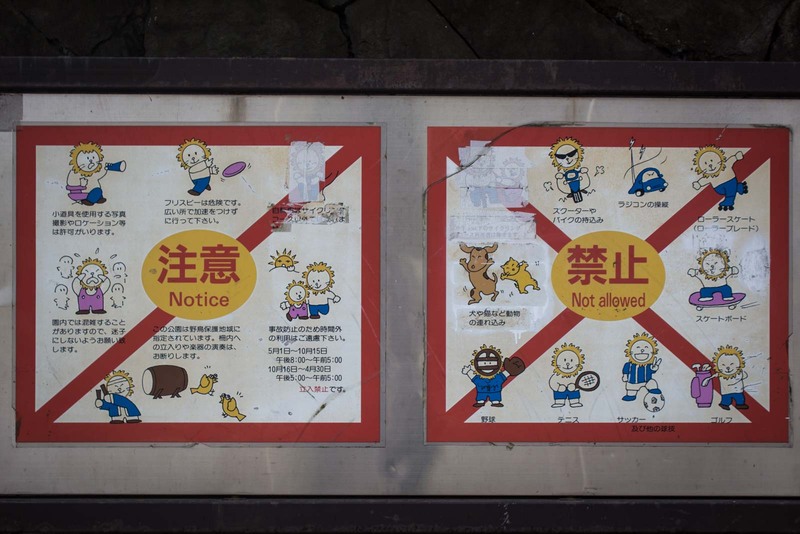 Part of my fascination with Japan is because of these rules. It amazes me that they have SO many, for even the slightest thing. Cool write-up! You’ve got to have them to make everything run smoothly. But I’m with you – it just makes the place even more fascinating, not annoying. I live in Yao, Osaka. I’ve seen almost every rule broken here. 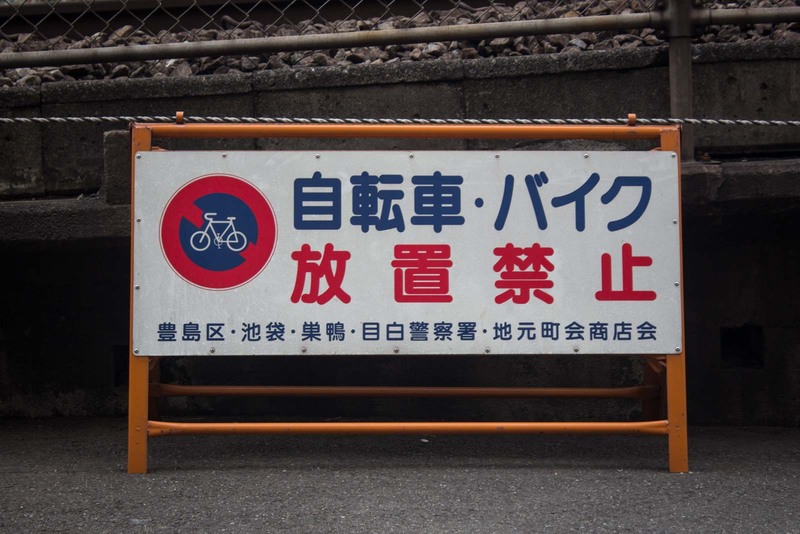 All forbidden signs are ignored by many, people leave bicycles where they shouldn’t, cars running red lights, people taking prams/strollers up the escalators, youngsters in priority seats on trains while oldies stand there looking at them. This has been happening all over Kansai. are you aloud to say ‘My name is Jeff’? Experience the things and learn something very new, that you don’t know about it.. Japan was very beautiful country and strict rules but for our safety and we behaved in a manner…. 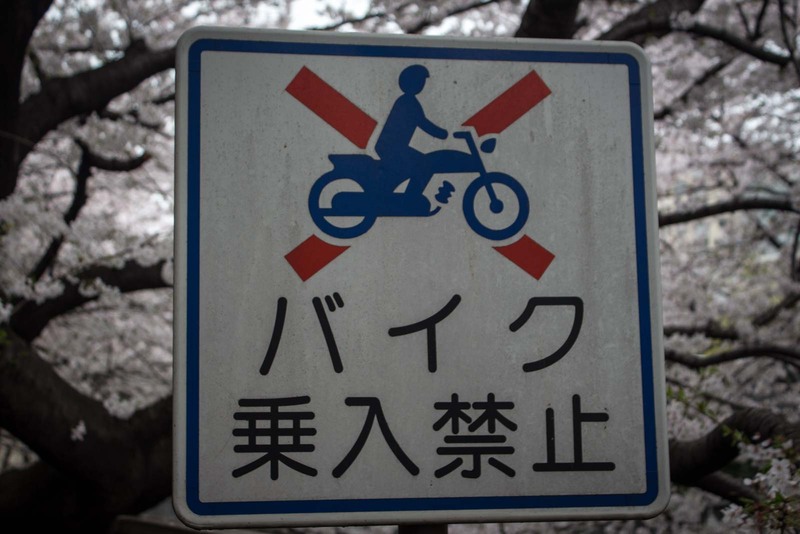 Yes, it’s quite important to follow the rules in Japan. They are there for a reason and, even if some of them seem a bit silly, people take them seriously. take care of the pace of the global marketplace. inside your capacity to be in business for your long-term. Asymmetric Digital Subscriber Linne or ADSL.